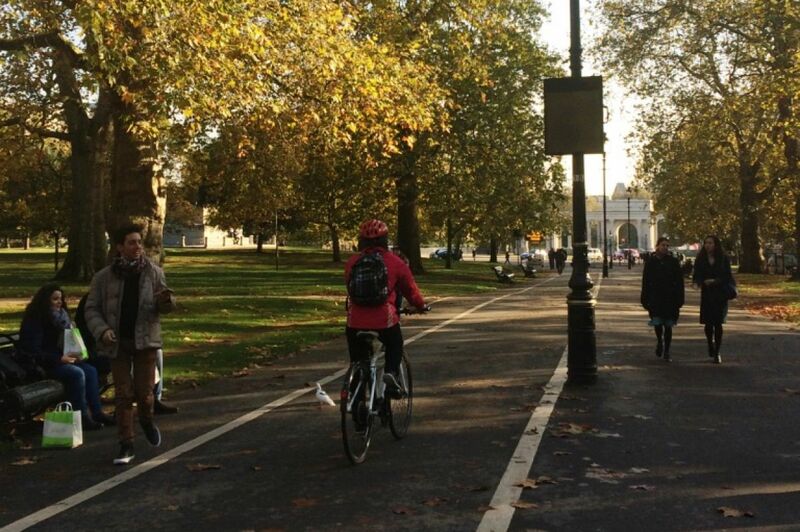 Cycle speeds as high as 32mph are being tackled in London’s Royal Parks as part of an initiative designed to slow down cyclists and improve safety for all visitors. From March 17, a project will get underway to install small speed bumps and highlight shared space on the Broad Walk in Hyde Park. The idea behind the scheme comes as latest statistics show that more than 1,200 cyclists commute on some cycle paths through Hyde Park during the rush hour, with four out of five travelling above the recommended 10mph – considered by The Royal Parks to be the ideal considerate cycling speed in its parks. In one instance, a cyclist travelling along the Broad Walk was clocked at more than 32mph – above the limit allowed for cars on some local roads. Simon Richards, who leads The Royal Parks’ Cycling Board, said: “The Royal Parks are unique spaces. They not only attract visitors on foot, bike or horse for peace and relaxation, but also daily commuter cyclists who pass through the parks on their way to work. “Everyone has to recognise that when they come into a park they’re entering a very different environment; for everyone’s sake we want to encourage cyclists to adjust their behaviour when moving from busy roads to peaceful paths, and similarly pedestrians need to be aware there are a whole variety of other users they have to watch out for. The latest work includes small speed bumps and new path surfaces at several key crossing points along the main stretch of the Broad Walk parallel with Park Lane. The aim is to alert cyclists that they are entering a different part of the pathway where more pedestrians are likely to be encountered. Changes will also be made to signage in other parts of the route at pedestrian entrances to reinforce the The Royal Parks’ Pathway Code of Conduct which states that pedestrians have priority over all other users, even in areas designated and marked for other purposes. Most of the Broad Walk is expected to remain open with only small sections entirely closed for short periods when cyclists will be asked to dismount. These measures are part of a much larger plan to improve the experience of all users in the parks linked to the wider Central London Grid scheme which sees the creation of road-based Superhighways across the capital to segregate cyclists from traffic and Quietways for more relaxed cycling.